The Electrical Department is situated at the back of the store next to the Post Office in the Radstock store. The department is open 08:00 to 20:00 weekdays and Saturday and 10:00 to 16:00 Sunday. 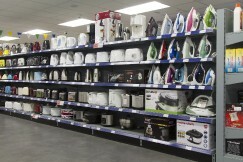 Table-top cooking: Kettles, Toasters, Coffee Makers, Sandwich Toasters, Grills, Soup Makers, Bread Makers, Ice Cream Makers, Deep Fat Fryers, Rice Cookers, Slow Cookers, Multi-Cookers. Payment over the telephone is not available. Items can be reserved however.